You’ve probably heard of the ketogenic (or keto) diet, and chances are, you’ve been tempted to try it or you already have. The keto diet involves a lot of fat and very little carbohydrates, which can make eating on-the-go difficult. Most protein bars rely on a surplus of carbs for a burst of energy and to be more filling, meaning many of them are no good for keto. This review will share with you some of the best protein bars that can actually help you stick to a difficult ketogenic diet. PDF Download: Click here to get a downloadable PDF of our 7-day keto diet meal plan that you can print out and use as a reference. What Makes a Protein Bar Keto-Friendly? There are a few things to look for in a protein bar to determine if it’s keto-friendly. The most important factor is to have minimal to zero carbs. Added grains are off limits in keto: rice, barley, buckwheat, oats, etc. It’s also important to remember that when looking at carbohydrates for keto-dieters, net carbs are always more important than the total carbs on the product’s packaging. Keto makes good use of healthy fat sources from animals and nuts, as well as the protein that often comes with them. Especially important are saturated fats. The best protein bars for keto should also not be overloaded with too much protein. Keto dieters should eat no more than 60g of protein a day. That’s a hard requirement for a protein bar, which really narrows the competition for the best of the best. Lastly, keto also demands that you stay away from processed food and ingredients in favor of grass-fed or wild sources. This requirement narrows down the search considerably! With all these crazy requirements for a protein bar, which ones can you be sure are keto-Friendly? Who Makes the Keto-Friendly Cut? It’s hard not to notice these delicious little suckers during your grocery trips. You’ve probably avoided Quest Bars because of the bright packaging and tempting flavors. They can’t possibly be healthy. Right? Think again. Quest Bars are a cult favorite among body builders, Pilates instructors, and fitness gurus alike. If you’re on a keto diet, you can enjoy them too! 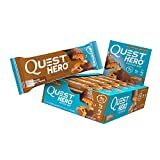 The Hero line of Quest Bars in particular is the number one Keto protein bar on this list because of its stellar balance of healthy saturated fats and low levels of net carbs and protein. Initially, the nutritional label on Quest Hero Bars is alarming: 30g?! Fret not. After taking fiber and sugar into account, you’re left with a tolerable 4g-5g of net carbs. A bonus with Quest Bars is how seriously they take their ingredients. It tastes delicious and is only sweetened with allulose, keeping your calorie count low. Yes, the number two choice on this list is another Quest bar. This time, it’s the Quest Beyond Cereal Bar. It’s called “Beyond Cereal” because of its intentional lack of traditional grains. It comes in with one of the lowest net carb counts on our list at only 3.6g. Since low-carb is one of the most important parts of keto, that makes this protein bar a winner. Plus, Quest Beyond Cereal Bars have a record low protein count for a protein bar: only 12g. Having this low number of protein and carbs makes this protein bar irresistible for keto-dieters in need of an on-the-go snack or post-workout boost. Unfortunately, the downside to Quest Beyond Cereal Bars the uninspiring amount of saturated fats. They do contain natural ingredients such as butter and almonds, but 2.5g of saturated fat was low enough to make this Quest bar number two instead of number one. Julian Bakery’s Paleo Protein Bars are pulling double duty—they’re so effective at rocking they paleo world, they work for keto too. With no sugar alcohols and being 100% Paleo (which means entirely whey-free), these bars are a great low-carb choice. In fact, they basically have none. After taking fiber into account, these bars basically have a measly 1g of net carbs—the lowest on the list. The trade off with the Paleo Protein Bars is that there is an emphasis on Paleo. As a result, these protein bars have 20g of protein. This may be pretty standard for a normal protein bar, but this is relatively high for someone on a keto diet. There’s also a dissatisfying lack of saturated fats. 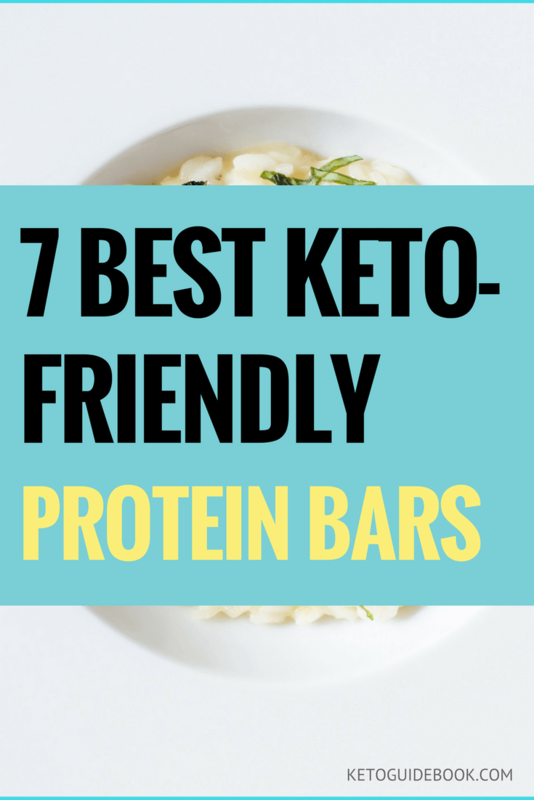 However, these bars are full of delicious and organic ingredients that definitely make the Keto cut. There are four different flavors, available individually or in Julian Bakery’s variety pack: Almond Fudge, Chocolate Chunk Cookie Dough, Chocolate Brownie, and Chocolate Lava (which is also vegan!). Oh Yeah! One Protein Bars have been a little more controversial than some of the other picks on this list, and it’s mostly because of the high carb and protein count. With anywhere from an estimated 6g to 11g of net carbs (depending on the flavor), you’re getting quite a lot for something that’s supposed to be “low-carb.” That being said, with many protein bars creeping up to 20g of net carbs, the One bars are relatively low. Additionally, with 20g of protein, you’re consuming about a third of your Keto protein recommendation in one bar. 20g is normal for a protein bar, but these may not be good for daily consumption. On the plus side, One bars do provide consumers with 7g of saturated fat—the highest any protein bar on our list offers. Since that saturated fat is coming from ingredients like almonds, coconut, and healthy oils, it’s a definite perk. Another upside is that they come in a variety of different flavors to suit all kinds of cravings. Between Cookies & Cream, Lemon Cake, Cinnamon Roll, Peanut Butter Pie, Birthday Cake, and Maple Glazed Doughnut, you’re sure to find something to satisfy you. Oh Yeah! One Protein Bars may not be the best protein bar to reach for on a regular basis, but they are a delicious treat. At the end of the day, they aren’t the worst thing you can eat either. Another contender for most scrumptious protein bars? ANSI’s decadent Gourmet Cheesecake Bars are almost too delicious to be a protein bar. But are they keto? They are, in fact keto…at least enough to make it as fifth on the list. With only 6g of net carbs, they do qualify as one of the most low-carb bars out there. As far as saturated fat and protein count, though? Not as impressive. These have a lackluster 2.5g of saturated fat and another standard 20g of protein. As far as nutritional facts go, the ANSI Gourmet Cheesecake Bars are strictly decent for keto. Kudos to ANSI, though, for using hormone-free and organic ingredients, as well as staying away from artificial sweeteners and hydrogenated oils. 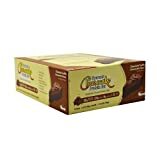 With four different flavors—Chocolate Peanut Butter, Birthday Cake, Chocolate Banana, and Chocolate Coconut—these Gourmet Cheesecake Bars are a decent every-now-and-then keto protein bar. This protein bar is a mainstay favorite for bodybuilders and high-performance athletes looking for a lot of protein and fewer carbs. It’s lower on the list because at 23g per bar, it’s pushing keto’s protein limitation. This bar probably only works for people who don’t plan on eating a lot of meat-based protein throughout the rest of the day. That being said, the Grenade Carb Killa bar does actually have one of the best saturated fat scores of the list: 4g of saturated fat is more than most protein bars. On the other hand, 8.2g of net carbs isn’t necessarily anything to brag about. Plus, with some unsightly ingredients like malitol, soy protein isolate, and sucralose, the Grenade Carb Killa does break a couple keto rules. Overall, though? Grenade’s Carb Killa is an okay low-carb option to lean on in a pinch. The last protein bar on the list is the Atkins Lift Bars—and it’s last because there isn’t necessarily anything special about it. These protein bars have a decent amount of saturated fat (3g) and a pretty low level of net carbs (6g). 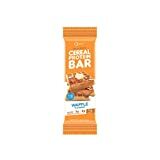 With a tad bit more protein than someone on Keto might like, this bar is an inexpensive, highly accessible option. 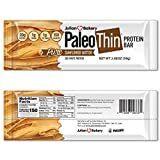 Though there isn’t anything magical about this bar and it doesn’t stand out among the other bars on this list, many keto-dieters claim the Atkins Lift Bar is their personal number one keto-friendly choice. Though they may be difficult to find, keto-friendly protein bars do exist. The key in finding them is to look for higher levels of saturated fat from natural ingredients, a low net carb count, and just a little less protein. Plenty of brands out there want to create products that satisfy the needs of every lifestyle and individual. Keto is no exception, and there’s bound to be a protein bar out there that suits your diet, your life, and your taste buds. Keto-friendly protein bars do exist. Unlike other protein bars, these snacks will have much lower carb counts (net carbs over total carbohydrates). Another difficult thing to look for in keto-friendly protein bars are two requirements most protein bars don’t meet: lower protein and higher fat. Though it seems odd, these are two Keto staples, and there are a few protein bars out there that make the cut. Do You Have Your Keto Basics? Enter your email address to receive our weekly update with our latest posts. Hundreds of thousands of people lost weight with the keto diet. Join them in the FREE newsletter for exclusive advice.